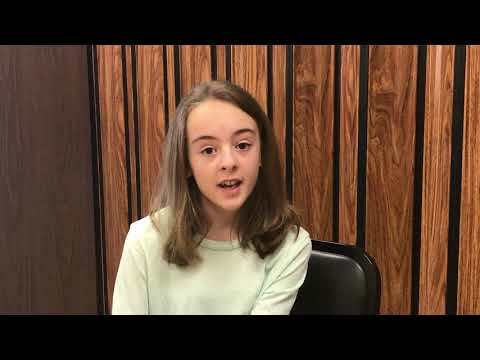 NASHVILLE — Courtney Good, a sixth-grader at Innovation Academy of Northeast Tennessee, is one of Tennessee’s two top youth volunteers this year in the Prudential Spirit of Community Awards. The nationwide program, which recently named 17-year-old Kennedy Musgrave of Nashville as the other Tennessee winner, honors young people for outstanding acts of volunteerism. Finalists included Science Hill High senior Alice Grosserode, 18. As state honorees, Courtney, 12, of Indian Springs, and Kennedy each will receive $1,000 toward college, an engraved silver medallion and an all-expense-paid trip to Washington, D.C. in May, where they will join the top two honorees from all of the other states for four days of national recognition events. During the trip, 10 students will be named America’s top youth volunteers of 2019. The trip with her mom will be Courtney’s first airplane flight. The program, in its 24th year, is conducted by Prudential Financial in partnership with the National Association of Secondary School Principals. If Courtney is a winner, she’ll get $5,000 to donate to a charity of her choice. Courtney , the middle school winner, was nominated by IA/Holston Middle School guidance counselor Jessica Hughes. IA is a Sullivan County science, technology, engineering and math school located inside Holston Middle. “She definitely stands out in my mind among students I’ve had the past five years (as a guidance counselor) for sure,” Hughes said. WHAT IS COURTNEY’S FOOD WAGON? Courtney started collecting food for families tending to their hospitalized children when she was 3, and last year used her story of surviving an extremely premature birth to help the Children’s Miracle Network raise money for sick kids. She was a 2018 ambassador for CMN and started Courtney’s Food Wagon to provide food for the family kitchen at the neonatal intensive care unit at Holston Valley. She also has provided gift bags to nurses, doctors and others at the Holston Valley NICU. “We were way open to her from the time she was little” about being premature, said Courtney’s mother, Martha Good. “I truly believe if it wasn’t for the staff there (Holston Valley NICU) I wouldn’t have her today,” Good’s mother, Martha, said. Courtney weighed 1.5 pounds when she was born 15 weeks prematurely, Martha Good said. Courtney spent the first four months of her life in the NICU and had to return to the hospital a few more times in the following years for lung issues. Courtney recalled how her family had to spend Christmas in the hospital with her one year, and she wanted to do something for other families in a similar situation. With the help of her parents, Martha and Mike Good, she came up with a plan for Courtney’s Food Wagon and began collecting food donations so that families don’t have to leave the hospital to eat. Her younger sister, Indian Spring Elementary student fourth grader Cassidy Good, also helps. To promote the project, Courtney handed out fliers, participated in a parade, got her school involved and hosted a Facebook page. Every Christmas since, she has delivered prepackaged food to the family kitchen of the pediatrics unit and NICU at Holston Valley. Because of her charitable work and her birth story, Courtney was selected to be a CMN ambassador last year. In that role, she has spoken at press conferences, appeared in advertisements and participated in fundraising events. In addition, her face has been featured throughout 22 Walmart stores, which have raised more than $220,000 for CMN. “I love that my story is helping to raise money for sick children,” she said. “I hope that families with sick children can see how healthy I am now and it will give them hope.” Courtney was on the IA/Holston Middle cross-country team and is trying out for track. She also plays flute in the band. As for the future? “I want to be a math teacher. I don’t know what grade or anything,” Courtney said. Among six Distinguished Finalists who received medallions in this year’s program, Science Hill’s Grosserode helped plan and build a playground for the Family Promise Day Center, an organization that offers shelter, meals, case management and homelessness prevention services to families. During the two-year process, she applied for grants, secured approval from the city, connected with builders and even designed the sign for the playground. For information on all of this year’s Prudential Spirit of Community honorees and finalists, go online to http://spirit.prudential.com or www.nassp.org/spirit.